Happy New Year! 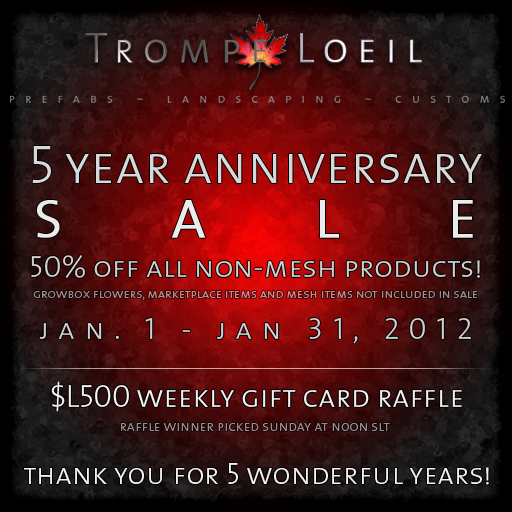 To kick off 2012, Trompe Loeil is holding a 50% off sale on all non-mesh products inworld! Plus, touch the raffle board to be entered into a weekly drawing for a $L500 gift card – we’re giving one away each week in January! Sale prices are good at any inworld Trompe Loeil location: our main store at Trompe Loeil Prefabs, and our outlet stores at Tableau and Truth District. Get 50% off prefabs, stores, landscaping items, skyboxes, and more – all through the month of January! Thank you so much for 5 wonderful years! We’re looking forward to many more!